This little book (200 pages) grapples with some of the biggest questions in science: What is life? How did it emerge? How can we make life? Along the way it also addresses a few knotty problems in the origin of life field such as: was the emergence of life inevitable or a freak accident and which came first, replication or metabolism? To do this and to resolve the paradox arising from the increase in organisation associated with life and the tendency of organized systems to spontaneously become disorganized, the author introduces a different way of thinking about the stability of replicating molecules. If there’s anything you wanted to know about the solar system, it’s safe to say that it’s probably somewhere in this book. A work of ambitious scope and detail, and clearly a labour of love, ‘Exploring the Solar System’ guides us through our local universal neighbourhood in great depth. With chapters covering the formation of the solar system, our sun, each of the planets, the Kuiper belt and other bodies, as well as solar systems elsewhere in the universe, there is little that Bond leaves out here. This book is dense – each chapter could easily be turned into its own textbook. Designed as an introductory textbook for undergraduates, it gives an essentially exhaustive look through what might form a first or second year university planetary science course. However, this exhaustivity is at the same time something of a weakness. It means that some topics are lacking in depth. In the chapter on the sun, we are guided through everything from nuclear fusion to an explanation of how eclipses happen. The ‘Earth’ chapter covers everything from the planet’s radiation budget to how to work out its surface. But each of these (incredibly interesting) topics only gets a few paragraphs, or in some cases a couple of (well done) diagrams. This means that any student looking to gain a deeper understanding will have to look elsewhere. ‘Exploring the Solar System’ achieves what it sets out to do. It is a well-written and produced textbook covering many aspects of solar system science. For the general reader, it sits on the more complicated side of the general popular science level, and even those undergraduates without a strong background in physics or astronomy might find some of what is covered a little bewildering. For those studying planetary science it provides an ideal introduction across a wide range of topics at an appropriate level, but will leave some looking for more. 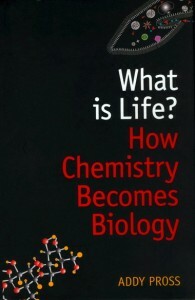 The early chapters summarize some of life’s characteristics including phenomenal complexity, teleonomy (purposeful character), and a far-from equilibrium state, which must be addressed by any new approach, as well as earlier ideas on the origin of life and problems associated with a definition of life. There follows a brief description of the scientific method and the advantages of reductionism. After a discussion of chemical reactivity, in particular catalysis and replication, the central concept of dynamic kinetic stability is introduced. The analogy of a fountain that persists over time but where the water is constantly replaced, is applied to molecular self-replication in which it is the population of replicators that is stable. Within this framework, stability is enhanced by an increase in reactivity (in contrast to traditional chemistry) in that more reactive replicators are better at making more of themselves. This process can be studied using the new discipline of systems chemistry, which deals with replicating molecules and the networks that they create, and is used, together with some exciting new results from RNA chemistry, to show that molecules that are more adept at forming networks (becoming more complex) are more efficient (stable) replicators. In other words, a simple chemical system can be transformed into a complex biological system and a mechanism exists for a smooth transition from inanimate to living systems. Addy Pross is not afraid to make controversial statements and even drops the odd bombshell but he does this in a clear and engaging way so that anyone with an interest in science can follow his ideas. By shifting the emphasis away from the historical approach (starting materials, location, conditions) to the arguably more significant and less intractable ahistorical approach that considers the underlying physico-chemical principles leading to the process of increasing complexity, he has made an interesting and inspiring contribution to the field.